Published: May 28, 2009 at 05:12 p.m.
Summers are always sweltering in Texas, but the Dallas Cowboys ensured that the heat will reach a fever pitch in Valley Ranch next season by releasing Terrell Owens. It's rare for a team to cut a player who had delivered the kind of production that Owens did during his three years with the Cowboys. The probable Pro Football Hall of Famer amassed 235 receptions for 3,587 yards and 38 touchdowns while serving as the Cowboys' No. 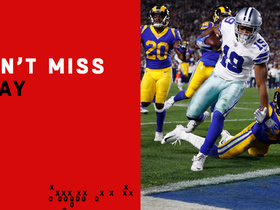 1 receiver, and his outstanding play and production attracted double coverage, opening the field for Dallas' other receivers and its running game. Without Owens on the field, the Cowboys' offense will lose some of the potency that presented problems for opposing defenses. With reports linking Owens' release to his inability to get along with the Cowboys' offensive coordinator (Jason Garrett) and star quarterback (Tony Romo), the pressure to deliver big results in 2009 is mounting on Dallas. 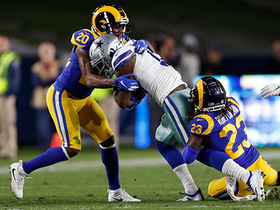 Compounding the issue is that each of the Cowboys' NFC East rivals significantly upgraded their defense through free agency and the draft. The Washington Redskins picked up the NFL's most dominating interior defender (Albert Haynesworth) in free agency and added a phenomenal pass rusher (Brian Orakpo) in the draft. The New York Giants fortified an already imposing defensive line with the additions of Chris Canty and Rocky Bernard, and they increased the speed of their linebacker corps by signing Michael Boley. Not to be outdone, the Philadelphia Eagles added two veterans (Sean Jones and Ellis Hobbs) to their ball-hawking secondary and made a host of offensive moves that might lead to high-scoring shootouts in the fall. With those challenges ahead, Garrett has plenty of work to do to remake the Cowboys' offense into the scoring machine that terrorized the league in 2007, his first season as coordinator. In a quarterback-driven league, it's essential to have a franchise-caliber quarterback, and the Cowboys have a budding star in Romo. The two-time Pro Bowler has been a statistical marvel in his three seasons as Dallas' starter, completing 63.6 percent of his passes and throwing for 81 touchdowns. Romo also boasts an impressive 94.7 passer rating and 16 300-yard passing games in 41 career starts. In spite of his impressive resume, Romo has been knocked for his inability to deliver clutch performances down the stretch. He sports a disappointing 5-10 career record in the final month of the season, including an 0-2 mark in the playoffs. Even though he isn't solely responsible for the team's late-season failures, his play has routinely been subpar during the Cowboys' playoff pushes, and Garrett must find a way to receive better play from his young star for Dallas to finally make it over the hump. With Owens no longer around as their "go-to-guy," the Cowboys will rebuild their passing game around Jason Witten and Roy Williams. Witten, a five-time Pro Bowler, has been Dallas' leading receiver the past two seasons and is one of the best tight ends in the league. He's a polished route runner with enough speed and quickness to threaten the middle of the field. While Owens garnered headlines for his production and his antics, Witten earned Romo's trust and became his top target in the clutch. Back in his customary spot as a No. 1 wide receiver, Roy Williams has the opportunity to return to Pro Bowl form in 2009. Williams, who came to Dallas in a blockbuster midseason trade with the Detroit Lions last year, has been pegged as Owens' replacement as the Cowboys' No. 1 receiver. The one-time Pro Bowler previously occupied that role in Detroit and has shown promise as a "go-to guy" in the passing game. Although he hasn't produced to Owens' level in the past, Williams has put up impressive numbers when healthy. In 2006, Williams finished with 82 receptions for 1,310 yards and seven touchdowns en route to earning his first Pro Bowl berth. Moreover, the five-year pro has averaged 14.5 yards per catch in his career and consistently produced "explosive plays" (over 20 yards) as a top target. Critics cite Williams' disappointing production as a Cowboy last season -- just 19 catches for 198 yards and one touchdown in 10 games -- as the primary reason he will fail as the team's new No. 1 receiver. But Williams was on the cusp of being regarded as an elite receiver in his previous four seasons, and he could return to that level as the focal point of Dallas' passing game. Like any elite passing team, the Cowboys need steady contributions from their complementary players to be successful. The team hasn't brought in someone to serve as its No. 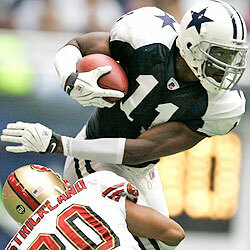 2 receiver, so Patrick Crayton, Miles Austin and Sam Hurd will duke it out for the right to play opposite Williams. Crayton appears to be the logical choice, given his production as a third receiver, but he seemingly faltered whenever Dallas relied on him as a starter. Thus, it wouldn't be a surprise to see Austin or Hurd take the job on opening day. Martellus Bennett could be the player who benefits from Owens' departure. Bennett showed promise during his rookie season as part of the Cowboys' double tight end package, and he's a potential matchup problem on the edge. 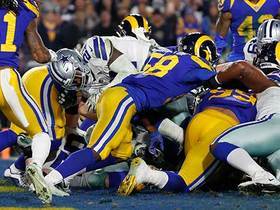 Bennett, who finished the season with 20 receptions for 283 yards and four touchdowns, has the speed and athleticism to emerge as the unheralded playmaker in Dallas' offense, which is expected to use more multiple tight end sets. While the Cowboys' passing game undoubtedly will go through an evolution without Owens, the team can assist its offensive transition by relying on a potentially explosive rushing attack led by a massive offensive line and a talented trio of backs. Former Pro Bowler Marion Barber III is widely regarded as one of the most physical runners in the league, and his willingness to pound the ball between the tackles often sets the tone for the Cowboys' offense. Even though he has never cracked the 1,000-yard mark as a runner, Barber has scored 31 touchdowns on the ground in the past three seasons and averaged 4.3 yards per carry with his hard-nosed, punishing style. Felix Jones, Dallas' first-round pick in 2008, gives the team a home-run hitter in the rotation. He averaged 8.9 yards per carry as a rookie last season and routinely displayed the explosiveness that makes him a threat to go the distance whenever he touches the ball. Although his first NFL season was limited to six games because of injury, Jones flashed enough potential to entice coaches and scouts. While Jones is expected to serve as the Cowboys' third-down or change-of-pace back, Tashard Choice will fill a key role as a rotation runner. A bruising inside runner with surprising power and pop, Choice averaged 5.1 yards per carry as a rookie and finished 2008 as Dallas' second-leading rusher with 472 yards. He opened eyes with his outstanding play down the stretch and will have a handful of carries in every game next season. With three backs capable of putting up 100-yard games, the Cowboys should use the threat of the running game to control the clock and set up big passes off play-action. To execute such a game plan, Dallas will need to run the ball more than the paltry 25.1 times it averaged per game in 2008. 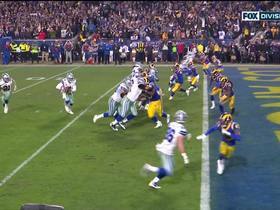 That isn't enough to fully establish the running game and often puts the weight on Romo to win it through the air. By effectively running the ball, the Cowboys would force defenses to use more eight-man fronts and create winnable one-on-one matchups on the outside. This not only would make life easier for Romo but alleviate some of the pressure on Williams, Witten and others in the passing game. Coach Wade Phillips enters the season squarely on the hot seat after failing to guide the Cowboys deep into the playoffs the past two years, but Garrett joins the fray after the team's eventful offseason. We'll soon see if the Cowboys can win with more substance than style after losing their top player.